The above info came from Jack, and was edited by yours truly (contact me). The image came from Conan-Star. Ray's Beyblading game is generally a smooth balance of defensive maneuvering and attacking. He's been entrusted with the Bitbeast Driger, the pride of his village. The White Tigers had a grudge against Ray because he left with Driger, but Ray explains that he left to gain new knowledge from the outside world, and he proves it in his battles in the Asian tournament, showing just how powerful Driger's Tiger Claw attack has become. Like the other people in his village, Ray's eyes turn catlike when he's in the zone. I have been told by some that Ray and the other White Tiger members (Lee, Mariah, Kevin, and Gary) are human, yet I've been told by others that they are humanoid cats, or neko-jins. They do look like they could be part-cat, as even Ray's eyes are slit like a cat, so I suppose being half-cat is possible, but there could be other explanations too, such as a genetic birth defect. I was also told by someone that they're implied to be Neko-jins in the manga. Earlier on in the manga, around volume 3 or 4, we see Lee basically acting like a lion. And then they talk to the village elders in volume 4 or 5... they have a clan called the Fang, and Tyson becomes part of it, and Lee was getting excited because Tyson was the first human to become part of the clan. If you can confirm this, or have any proof one way or the other, please contact me. On the 2nd Season (V-Force, episode 42, "Fortunes Dear and Dire"), when the BladeBreakers are deciding who will fight together, Hillary uses books to help them to choose. One of these books says that the youngest fighter needs to fight together with the oldest fighter, so Kenny partnered Max, Tyson, Ray, and Kai according to age. This showed that Max was the youngest, followed by Tyson, then Ray, and finally Kai. Hilary's exact quote is "For instance, that book says the youngest player should team up with the oldest player, that means Kai and Max should be partners". However, the second Beyblade DVD contains character bios which state that all the Bladebreakers except for Kenny are 13 years old (if you can get a picture of this, please contact me). Why does this matter? Because I'm told that originally, Kai and Tyson were both 12, but then Tyson had a birthday and turned 13, making him older than Kai. And thus, this would create a conflict with the above stated ordering of ages. Assuming they are both 12 to start with, if both Kai and Tyson had their birthdays sometime before or during the episodes shown on the 2nd DVD, then they could both be 13 years old as the 2nd DVD bios states. Of course, I'm also told that Ray is the oldest among them, and Max is older then Kai, but he's also younger than Tyson. This would make Ray the oldest, followed by Tyson, then Max, and finally Kai. I have not been shown any evidence to support this ordering of ages and it conflicts with the previously stated information so I would not consider this order to be correct. If you can provide any additional hard evidence from official sources regarding the ages of these characters, please contact me. I've also been told that his birthday is July 1st, July 8th, July 12th, and October 8th. If you know for sure by means of some official source, please contact me. Usually quiet, intense and determined, with a somewhat dry sense of humour, Ray is arguably the most mature member of the Bladebreakers, barring their captain. 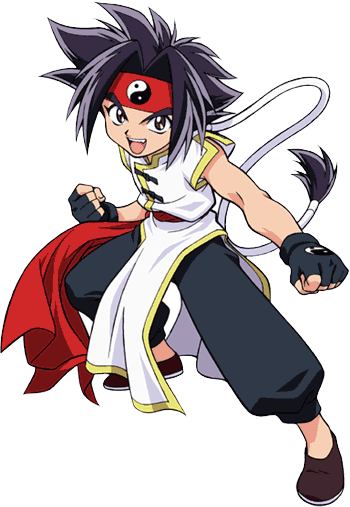 He used to be the best blader on the White Tigers team, but left the isolated little mountain village in which they grew up to learn more about beyblading.